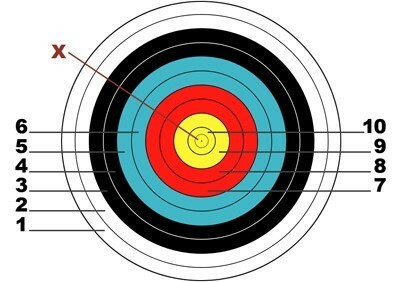 Targets are one of the most distinctive and important parts of archery. Many archers remember what it felt like to shoot their very first bull’s-eye. It can be a very exciting and dramatic moment, giving the archer a sense of accomplishment and earning smiles all around. Many archers also remember how eager they were to put another arrow on the string and try hitting the centre of the target just one more time. Throughout history archers from every background and shooting at all kinds of targets, have written of this feeling and the way they get swept along by excitement on their lifelong quest for accuracy. The standard WA target consists of ten rings in five colours. Within the 10-ring you will find a smaller ring with an “X” marked at the centre. This is known as the X-ring. For compound shooters at indoor tournaments, it becomes the 10-ring and the rest of the gold area becomes the 9-ring. When archers shoot the same score there are a number of ways to break the tie, depending on the type of competition. During a shoot off, the two archers involved will be the only ones on the shooting line. Officials put the tournament on hold so the competitors may decide the tie-breaker before shooting resumes. In situations where the archers are still tied after a shoot off, judges will measure the distance from the arrow to the centre of the target to determine the winner.